I thought we had a good showing, we got off to a fast start, slowed down a little bit in the second quarter, and then we picked it back up. 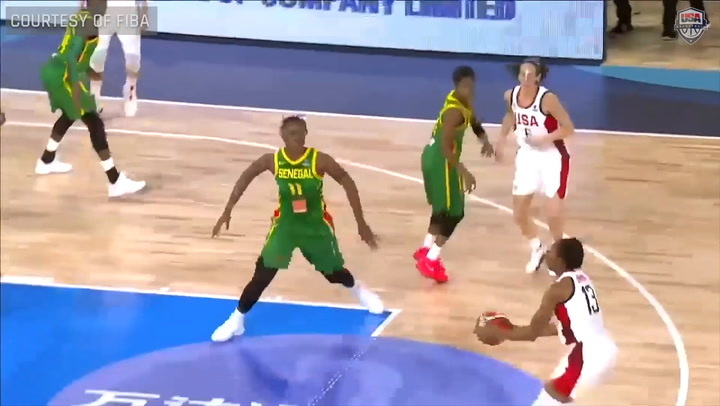 A true part of what USA Basketball is all about is being able to insert a lot of talent into the game. They started to play a little bit of zone, so we had to beat the zone down the floor. We just played faster basketball, playing in transition, and allowed them to sit back in that zone. I thought we made some adjustments defensively that allowed us to turn them over and create some easy buckets to open the game up. Well I think that is one of the strengths of our basketball team. I thought we did a great job of just moving the basketball, getting us into our high-low looks. I think this team is a very unselfish basketball team with a lot of weapons. Tonight, we did our job, we got the ball into the paint and I think that is a place in which we have the advantage over a lot of teams. I thought they all just played off of what our veteran players gave us. You know, anytime you’re playing with such talent, I mean we have six Olympians on this particular basketball team, you rise to the occasion of playing at that level, so I thought they all did a great job given the committee and opportunity to see them play, and see them play well. No I think we’re just airing on, you know just being cautious, she’s got (WNBA) training camp. I think she sustained a neck injury, I think an elbow to the neck, and we just didn’t want to put her in a position where she’d be out for any days of training camp. I thought this game was great, you know Dawn [Staley] said it in her pre-game talk, we beat up on each other for two days and now we got to beat up on somebody else. And more than anything, it’s just building blocks, you know, today and really the last three days we’ve been able to set the foundation, set the ground work for what will be, hopefully, the building blocks for the World Cup and beyond. So this is just the first step but I think it was a pretty good one. Probably just because we’re used to playing with each other, we’re used to playing against international competition, we know what to expect of one another so it’s easier to just kind of wing it because, in all honesty, you know, we’ve only been together for three days. It’s a brand new thing – and basketball is a team sport and it takes a lot of chemistry to look really good out there. So yeah, that’s probably what that was, just us being familiar with each other. But you could see as the game went, yeah, we had some tough stretches, that’s going to happen, but as the game went people started to settle down a little bit. There’s also, of course, new players to this so they’re going to have some jitters but once that all cleared I think everybody kind of started to figure out their places and where they’re kind of going to fit in and you could see it come out in the second half. Yeah, you could tell a lot of the younger players came in and were throwing the ball all over the place. A few nerves, but I didn’t lose my confidence. It’s nerve wracking … you’re chasing your dream so of course (there were nerves). Kind of right after those two turnovers I had. I was like, okay, just settle down a little bit. I think once you get in the game, run up and down a few times … your adrenalin is pumping so much and I was amped up. (My nerves) went away right after that. I’ll definitely remember those two turnovers. I think it’s a great story to tell – the first game I stepped in with the National Team I threw the ball over, but it’s the resilience and the growth in not crumbling, whereas maybe as a rookie or second-year player I would’ve turned the ball over and maybe lost my confidence. But here it’s more playing with people you’re not used to so for me, that growth perspective is big. Just the chemistry over time out there with (Diana Taurasi), Sue (Bird) and (Breanna Stewart). We had the opportunity to play with each other in previous years so I think it’s just the chemistry of knowing where we’re going to be and them getting me the ball … it worked. I’m liking where we’re going. I think we have a little ways to go, but I’m happy with the direction we’re moving in. Most definitely. I think Dawn (Staley) did a good job of making sure we’d go out there and be confident so I think that’s why we played a lot in the first half. The second half definitely was about the babies and making sure they go out there and learn and stumble along the way, but at the same time just know that it’s okay to mess up and just keep pushing. So far, so good. You know me, I’m easy. I don’t complain and go out there and try to do the task at hand and go from there. I think we’re moving in the right direction. We can’t really say because we don’t know if these pieces are still going to be the same once we hit World Cup and what pieces we’re going to be adding back on. Right now I’m liking the direction we’re moving in, but I’m pretty sure we have a lot more work to do. It was awesome. Playing in Seattle and having some of the fans you know and the season ticket holders here, and playing with Team USA, it was special, something I won’t forget. It was electrifying, it’s really cool to see a preview of what the season will be like. I missed way too many shots. For me, it’s doing the little things. Boxing out, rebounding, pushing, making the right decisions. I don’t know how many turnovers I had but for me that is a big thing, keeping them low. Hopefully they weren’t too high. I was just trying to get a rhythm, you’re playing with all new players so just trying to be a good teammate. Yeah, that’s something that I’ve been focusing on, my defense. I definitely think I can be a really good defender. One, I am in better shape, and two it’s a mindset of pride and not getting beat. It’s definitely something I’ve been working on. So for me, its success because those are the two things I’m really focusing on. Of course, I think that’s why we’re all here. We definitely want a shot of winning a gold medal and being on the World Cup. A gold medal is the highest achievement you can have, that’s definitely one of our goals. Energy, leadership and execution. That’s really big. Obviously they’ve been playing together for a while, they understand each other. They understand not to force things, that’s just their experience. The younger players are trying to get to that. Yeah I mean, once everyone settles in, anyone gets comfortable, lets loose. There’s no pressure. That’s with every team, you have two halves for a reason. Definitely, Defense is something I’m definitely working on. Steals and turnovers. Execution and really trying to play free. Not thinking too much or anything. Dan. Our Storm coach. That’s the first thing we talked about is his defense. It’s a mindset, knowing that I can and I will. That’s next level for our team. We can get out and we can guard and we can get easy points by getting steals. We have to focus a little more on staying connected on defense, using my length and athleticism. She’s always someone that I’m been watching for years and listen to all the time. She’s always talking and is a really great leader. No matter where she’s playing, she always plays her game. She never shies away from that and for me, that’s something I want to do as well, so what’s better than to learn from her? She’s the goat. Any time I talk to him, there’s three things, first it’s always to just keep it simple. And then to know that you’re shooting and you guard. You shoot and you guard. It’s pretty black and white, it’s really simple. You do those three things, and that’s what basketball is about from my position. I think it was, going off of what Dawn [Staley] just said, great to come out and play in our first exhibition game especially in Seattle. 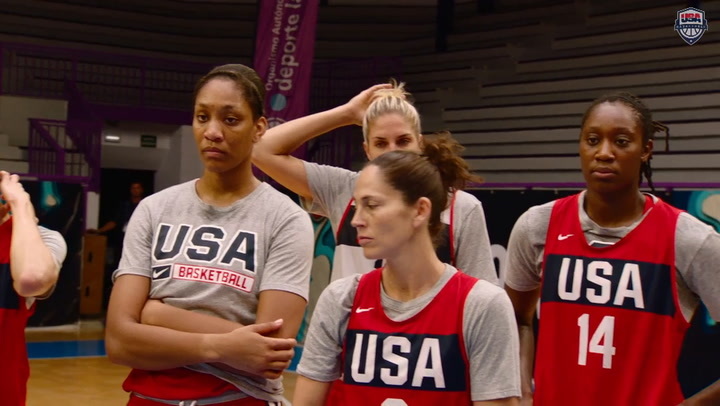 You know, usually with USA Basketball we don’t have a lot of time together so the fact that we did pretty well with the past few days of practice and, you know, any time you’re able to come out and represent USA it’s an honor and it’s a lot of fun when you have the other best players in the world just playing around. It was great and I think it’s great timing, you know, as training camp starts on Sunday. Just to get back out on the court at Key [Arena]. You know, obviously we always have a lot of support every time we come out on the court here and, you know, hopefully we’ll come back and play here some more. That does feel good. I haven’t been playing basketball like that in a five-on-five setting since probably December so sometimes it feels good when you put a lot of time into the gym. The last three months have been a lot of rehab, a lot of strengthening and trying to get into better shape. Today felt good. I think as a team, we looked good in stretches and that felt good for everyone. 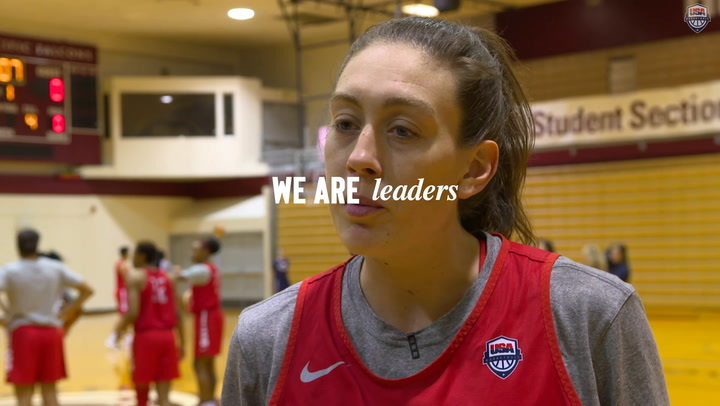 I just think when you get together with USA Basketball, people change just a little bit on their expectations and give into the team mentality. We’ve talked to a lot of the younger kids and we told them to keep it simple, go out there and have fun, you’re here for a reason and to trust your teammates. I think for the three days we were together that this team did that really, really well. That’s all part of the process. I can remember when Sue and I were younger that there were times when things felt like they were going really, really fast. As you get older, things slow down a little bit and you can go back to that experience that you’ve had. Everything doesn’t seem like that big of a deal. I think in the second half they did a better job of coming in and playing a little bit more relaxed. You can just tell those are veteran players with Sue, Stewie, Syl and Seimone (Augustus) and myself. We’ve been on this team for a long time and we know what’s expected. We always tell each other to just stay out of each other’s way. Sometimes it’s just as easy as that. When you have talent like that on the court, you just have to make sure you use it. Dawn had been great. I was in camp in Columbia (South Carolina) in February and got a little taste of the things she wanted to put in. In these three days, you can just feel her leadership and the things that she wants to implement, both on defense and offense. There’s a reason why she was the best point guard in the world for a long time. And now she’s been so successful (at South Carolina) and she’s going to continue that with our team. Oh, it feels so good (laughs). I miss Coach Auriemma. He’s meant a lot to a lot of us. I still talk to him on the regular and he’s still cheering from afar and still has a hand in being on the (USA Basketball) committee. He’s still very involved, but I think Dawn is well prepared for this. She’s showed it in the last couple camps.